Christina Moss Naturals promises a moisturizer that works for all skin types using certified organic ingredients, with the benefit of 17 years of research behind it. So important is the emphasis on freshness that natural licorice has been used as the preservative, so as to keep the natural nature of the concoction consistent from start to finish. The manufacturer promises that Organic Facial Moisturizer will hydrate, nourish and feed your skin without clogging pores, thanks to the natural oil blend. Let’s start the review of this moisturizer, then, by looking more closely at the natural oil blend. What’s In Christina Moss Naturals Organic Facial Moisturizer? This natural oil blend is noteworthy on two key fronts: it is bound to be light, fast absorbing, deeply penetrative and will, therefore, work its rejuvenating magic without clogging your pores or creating an oily film. Secondly, the grape seed and aloe extract mean that indeed the blend is suitable for sensitive skin as these two deeply soothe cells, act as an astringent by tightening pores and also detox and cleanse the skin from the inside very well. It is also saturated with hydration. By the same token, two notable omissions from what would have been a superior synergistic blend are shea butter and sweet almond oil. Almond oil, in particular, is light and packed with anti-aging, nourishing properties. Looking at this formula we do not think that it contains enough of a moisture barrier to actually seal in this precious hydration (without clogging your pores). Here, medical-strength silicone is always the winning choice of moisture barrier. Our other concern mainly has to do with the lack of concentrated Vitamin E and C as separate ingredients. These boost collagen production, keeping your skin smooth, supple and firm. 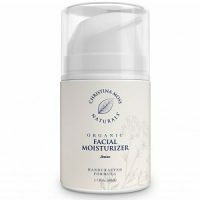 How Do You Use Christina Moss Naturals Organic Facial Moisturizer? Cleanse your skin and apply a thin layer once in the morning and once in the evening. The formula is designed to be free of allergens and toxins and, specifically, not to clog pores. It is therefore also consequently designed to be non-greasy and to sink into your skin quickly. This should mean that you can apply your makeup over the moisturizer without waiting long. A 1.7-ounce jar with a covered pump-top mechanism is priced at $25.99 on the product website. There are no discounts. There is an impressive 6-month freshness guarantee. If you find anything to be amiss in this time, a replacement jar will be sent to you or you can get a full refund. On the face of it, this seems to be a strong and consumer-centric policy. This product does seem to go the distance regarding having a successful non-toxic, cruelty-free, organic ingredient mix. 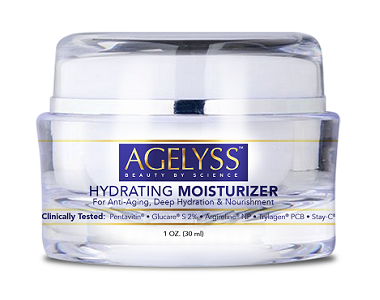 The ingredients are certified organic and the moisturizer is also preservative free. It is very rare for an essential oil mix to cause any skin irritations so we also agree that the formulation is suitable for all skin types. It is also clear that it is bound to be effective regarding at least certain expectations one would have of a moisturizer as it surpasses the 10% minimum active ingredient requirement. That said, all the organic oils in the world cannot compensate for key collagen boosters and nutrient-bearers such as Vitamin E and Vitamin C, or the free radical scavenging assistance provided by algae extracts. The nature of the synergistic oil blend could have been enhanced with clinically proven plant oils such as Shea Butter and Sweet Almond Oil. While this is not a weak formulation by any means, based on research, it cannot retain the hydration the skin requires or feed it the full depth of nutrient enrichment required to keep it young, smooth and glowing.